Here are the accessible features and how to enable and use them. A hidden menu of shortcuts appears when the user begins to tab into the editor. Help text is displayed for the shortcuts. 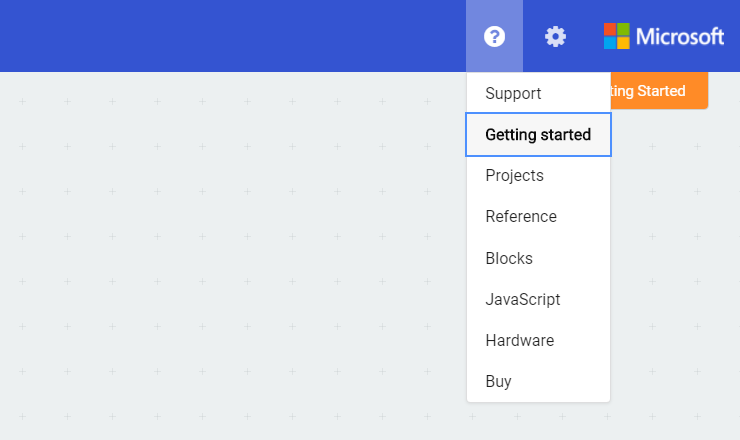 You can use the Tab key to jump between MakeCode controls. Use Shift+Tab to tab in reverse order. As you tab through the UI controls, you can see an indicator around the UI element once the element gains focus. Sometimes MakeCode shows a dialog on top of the editor. When a dialog is displayed, keyboard navigation is restricted to just the elements inside the dialog. To close a dialog, navigate to the close button (shown as an X at the top right or top left corner) and press Enter or Space. The Escape key will dismiss the dialog without having to navigate to the close button. By default, pressing Tab in the editor will insert the tab character. Toggle this behavior by pressing Control+M on Windows or ⌘+M on Mac. In order to jump to the toolbox from the editor. Press Control+Alt+T on Windows or ⌘+Alt+T on Mac. When navigating through the editor with the keyboard, focus is shown with a blue outline around the interactive element. When a contextual menu opens, the Top and Bottom arrow keys navigate into, through, and out of the menu. The Enter or Space keys validate the selection. Pressing Tab or Shift+Tab moves to the next or previous interactive element outside of the current drop-down menu. The documentation for Microsoft MakeCode is also accessible. Just like on the main editor page, a hidden menu is available to access to some shortcuts, such as jumping to the main content of the page. Use the Left or Right arrow keys to expand or collapse menu items. Several screen readers are available to help to use MakeCode. JAWS is a popular commercial screen reader for Windows. NVDA is a free screen reader for Windows. Press the Windows key to open the Start Menu, type "Narrator", and press Enter. Use the Ease Of Access section in the Windows settings. Set Narrator to On. Use the Universal Access pane of System Preferences. The high contrast helps people to locate and distinguish between the different visual elements in the MakeCode editor. This is enabled by each MakeCode target with its own use of color and contrast. So, a high contrast view is not always available in every instance of a MakeCode editor (partner editions). 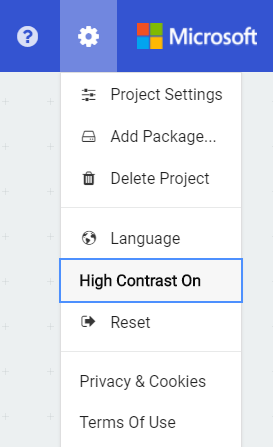 The high contrast mode in the editor is available even when the operating system configuration hasn’t enabled it. In MakeCode, it is enabled manually from either the Hidden Tab Menu or the Settings menu.